visit wineries in the Montalcino area - food and wine guided tours by experienced guides. Montalcino is a pretty hill top town in the province of Siena Tuscany. It takes about 2 hours from Florence and 1 hour from Siena to get there, so it makes an ideal day trip from one of these 2 main towns. The main attraction of Montalcino is its world renowned red wine. 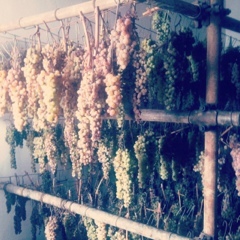 As many traditional Tuscan wines the main grape used here is the Sangiovese variety which produces 2 main wines: Brunello di Montalcino DOC and Rosso di Montalcino. The latter is normally a younger wine with lots of freshness and berry tones. 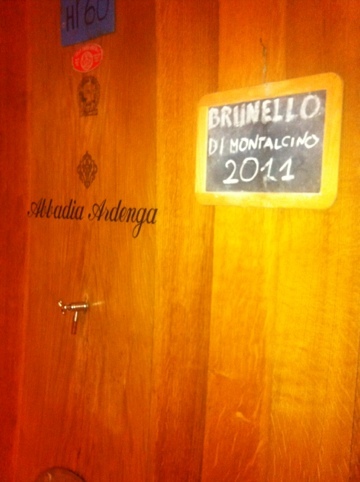 The regulation of the consortium to make Rosso di Montalcino are less strict compared to the Brunello, in fact Rosso di Montalcino will spend only one year in the wooden barrels before bottling. The real king of the these gentle and sunny hills is Brunello di Montalcino. The wine is aged at least 5 years in large oak or hash barrels. Compared to its younger version it has more complexity and structure. Sometimes it has mineral and pleasantly bitter tones and it is the perfect match for meat dishes such as the succulent heavy weight Fiorentina but also recommended with Pecorino di Pienza, or the peppery prosciutto toscano. During our tour we would recommend to visit 2 wineries in the area such as Abbadia Ardenga and Altesino winery. The former is an ancient 15th Century fortified abbey with secret underground passages and a passion for wine making dating back several centuries. Here at the winery you will taste 4 wines with the accompaniment of local food. Our tour will continue to another nearby wine estate namely: Altesino Winery. Here our guests will have Tuscan style lunch which will include tasting of Rosso di Montalcino and Brunello. The lunch ends with Torta della Nonna accompanied with Vin Santo. Upon request we can also visit the town of Montalcino with a qualified guide to discover the history of this beautiful hill top fortified settlement. Our guests can also learn about the disputes between Florence and Siena for dominance during the renaissance. Not far from Montalcino, and a easy reach from Siena it is also possible to visit wineries making vino nobile di Montepulciano made nearby in the homonymous town. The noble wine of Montepulciano is also made from Sangiovese grapes (minimum 70%) and aged 2 years or 3 years for the reserve. For those looking for a younger wine it is also possible to taste Rosso di Montepulciano, which is less sophisticated yet easily enjoyed on it own or with a light lunch. Many foodies know Pecorino very well for its fragrant spiciness and full body. Pienza not far from Siena and Montalcino is another gourmet destination where interested travellers can visit the production of this cheese which is aged for at least 90 days in barriques of ash wood. For those interested in food and wine tour from Florence and Siena, the area has plenty to offer. 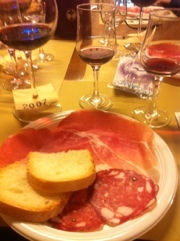 The main dedication of the area is red wine which can be matched with cheese and ham experiences. However In Tuscany the wineries are the one which should be of main interested of the food traveller, of course with the possibility to match the experience with local food such as the wonderful Fiorentina steak.